Once brothers in arms, Bentley and Rolls Royce are now German-owned competitors. That was obviously unacceptable to the builder of today's Nice Price or Crack Pipe Turbo R, but is its price also a match made in heaven? Stuffing a Miata full of LS2 V8 may seem as great as discovering that you can see your neighbor sunbathing naked from your house. According to the 77% who gave yesterday's thus-equipped MX-5 a Crack Pipe loss, the discovery of that car's price was akin to finding that neighbor to be a 350-pounder with back hair like a forest that swallows fairytale children. Yeah, there are plusses and minuses to damn near everything, that's just what makes this crazy world go around. Today for example, we have a 1991 Bentley Turbo R, once the poster child for stately motoring with alacrity. This one however, apparently wasn't stately enough, as someone has given it a nose job, wanting it to look like a Rolls Royce Phantom. You might recall the Bentley in its original form, the Turbo R featuring the locomotive-like 6.75-litre boosted to an estimated 440 bhp by a Garrett TO4B turbo. That was enough to move the 5,270-pound car to 60 from a standstill in under 7 seconds. Of course fast and heavy demands a trade-off and in the Bentley's case that was mileage in the single-digits around town. On premium petrol. This one however is different, just like Forrest Gump, only not so Tom Hanks. Dropped on wheels off a gardener's trailer, it has a custom bumper cap in back, under the stock lamps. That means driveway aprons will demand careful examination before attempting, but it's the front of the car that's where the real action lies as that where it's all Faux's Royce. 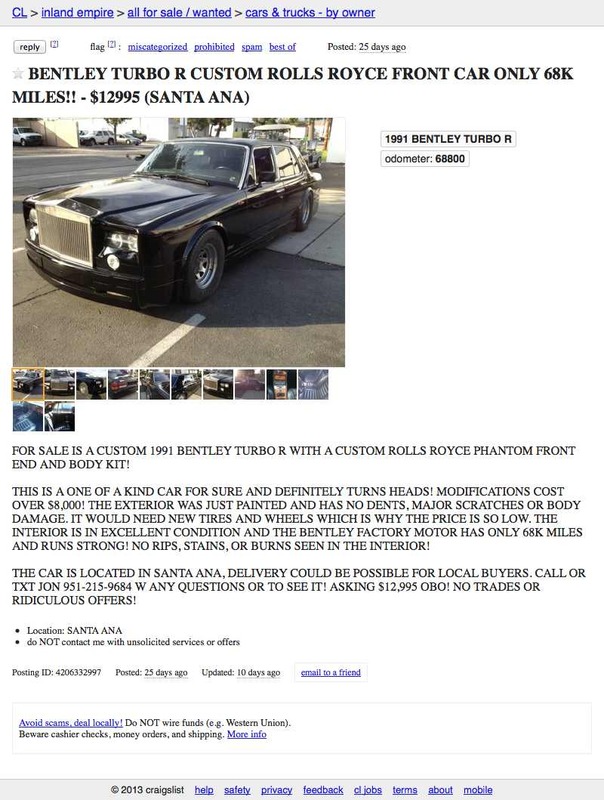 It's a shocking transformation considering that this very model was once sold as a Rolls. Instead of just switching out the grille and front clip with that model, this Bentley has been fitted with a custom nose that attempts to emulate the later Phantom - albeit only passingly. There's no Spirit of Ecstasy, and honestly, neither the grille nor the lamps look quite right. But to the uninformed, this might be about as jaw droppingly cool as having the cast of Duck Dynasty tickling the tables of your neighborhood Waffle House with their beards. The interior is stock and that's a good thing. These cars were hand-built from the finest in tree and cow and still look nicer than most peoples' living rooms. The ad notes no major issues with the innards, nor with the body aside from the institutional wheels. The car has but 68K on its clock. This generation of Bentley is notorious for electrical gremlins, and of course having been born in Crewe, they are not the cheapest things to repair when things go wrong. This one, owing to its weirdo nose and wheels, comes in at $12,995, which of course is like off-lease Nissan Versa money. Sure, that Versa will get you back and forth to work reliably, and a pregnant lady to the hospital when needed. The Bentley on the other hand might just be a roll of the dice on either of those fronts. It'd sure be a nice place to sit while waiting on the AAA though. 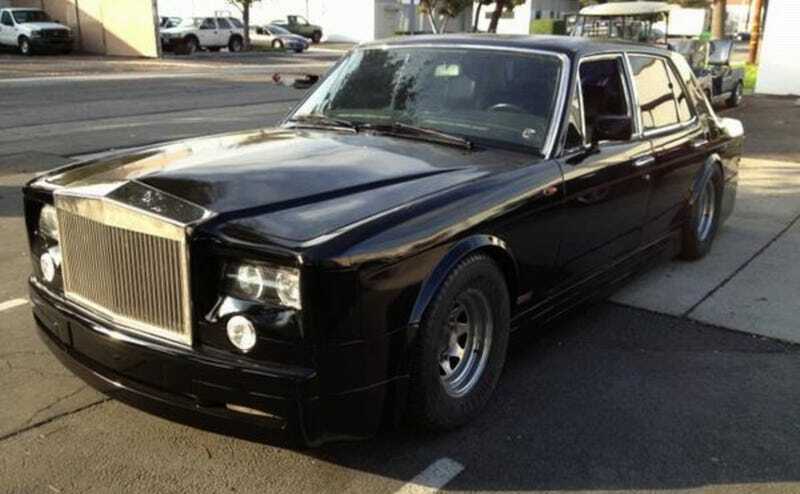 What's your take on this custom Bentley Roller for a fin shy of thirteen large? Is that so good a deal that you're already scrounging the fridge for Grey Poupon? Or, is that Rolls nose just the tip of this Titanic's iceberg? H/T to mrpeugeot for the hookup!